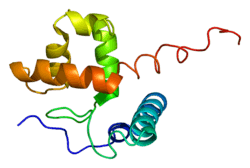 AT-rich interactive domain-containing protein 1A is a protein that in humans is encoded by the ARID1A gene. ARID1A is a member of the SWI/SNF family, whose members have helicase and ATPase activities and are thought to regulate transcription of certain genes by altering the chromatin structure around those genes. The encoded protein is part of the large ATP-dependent chromatin remodeling complex SNF/SWI, which is required for transcriptional activation of genes normally repressed by chromatin. It possesses at least two conserved domains that could be important for its function. First, it has an ARID domain, which is a DNA-binding domain that can specifically bind an AT-rich DNA sequence known to be recognized by a SNF/SWI complex at the beta-globin locus. Second, the C-terminus of the protein can stimulate glucocorticoid receptor-dependent transcriptional activation. It is thought that the protein encoded by this gene confers specificity to the SNF/SWI complex and may recruit the complex to its targets through either protein-DNA or protein-protein interactions. Two transcript variants encoding different isoforms have been found for this gene. This gene has been commonly found mutated in gastric cancers, ovarian clear cell carcinoma, and pancreatic cancer. Lack of this gene/protein seems to protect rats from some types of liver damage. ARID1A has been shown to interact with SMARCB1 and SMARCA4. ↑ Takeuchi T, Furihata M, Heng HH, Sonobe H, Ohtsuki Y (Aug 1998). "Chromosomal mapping and expression of the human B120 gene". Gene. 213 (1–2): 189–93. doi:10.1016/S0378-1119(98)00194-2. PMID 9630625. ↑ Takeuchi T, Chen BK, Qiu Y, Sonobe H, Ohtsuki Y (Feb 1998). "Molecular cloning and expression of a novel human cDNA containing CAG repeats". Gene. 204 (1–2): 71–7. doi:10.1016/S0378-1119(97)00525-8. PMID 9434167. 1 2 "Entrez Gene: ARID1A AT rich interactive domain 1A (SWI-like)". ↑ Wang K, Kan J, Yuen ST, Shi ST, Chu KM, Law S, Chan TL, Kan Z, Chan AS, Tsui WY, Lee SP, Ho SL, Chan AK, Cheng GH, Roberts PC, Rejto PA, Gibson NW, Pocalyko DJ, Mao M, Xu J, Leung SY (December 2011). "Exome sequencing identifies frequent mutation of ARID1A in molecular subtypes of gastric cancer". Nat. Genet. 43 (12): 1219–23. doi:10.1038/ng.982. PMID 22037554. ↑ Wiegand KC, Shah SP, Al-Agha OM, Zhao Y, Tse K, Zeng T, Senz J, McConechy MK, Anglesio MS, Kalloger SE, Yang W, Heravi-Moussavi A, Giuliany R, Chow C, Fee J, Zayed A, Prentice L, Melnyk N, Turashvili G, Delaney AD, Madore J, Yip S, McPherson AW, Ha G, Bell L, Fereday S, Tam A, Galletta L, Tonin PN, Provencher D, Miller D, Jones SJ, Moore RA, Morin GB, Oloumi A, Boyd N, Aparicio SA, Shih I-M, Mes-Masson AM, Bowtell DD, Hirst M, Gilks B, Marra MA, Huntsman DG (October 2010). "ARID1A mutations in endometriosis-associated ovarian carcinomas". N. Engl. J. Med. 363 (16): 1532–43. doi:10.1056/NEJMoa1008433. PMC 2976679 . PMID 20942669. ↑ Shain AH, Giacomini CP, Matsukuma K, Karikari CA, Bashyam MD, Hidalgo M, Maitra A, Pollack JR (January 2012). "Convergent structural alterations define SWItch/Sucrose NonFermentable (SWI/SNF) chromatin remodeler as a central tumor suppressive complex in pancreatic cancer". Proc. Natl. Acad. Sci. U.S.A. 109 (5): E252–9. doi:10.1073/pnas.1114817109. PMC 3277150 . PMID 22233809. ↑ Kato H, Tjernberg A, Zhang W, Krutchinsky AN, An W, Takeuchi T, Ohtsuki Y, Sugano S, de Bruijn DR, Chait BT, Roeder RG (February 2002). "SYT associates with human SNF/SWI complexes and the C-terminal region of its fusion partner SSX1 targets histones". J. Biol. Chem. 277 (7): 5498–505. doi:10.1074/jbc.M108702200. PMID 11734557. 1 2 Wang W, Côté J, Xue Y, Zhou S, Khavari PA, Biggar SR, Muchardt C, Kalpana GV, Goff SP, Yaniv M, Workman JL, Crabtree GR (October 1996). "Purification and biochemical heterogeneity of the mammalian SWI-SNF complex". EMBO J. 15 (19): 5370–82. PMC 452280 . PMID 8895581. ↑ Zhao K, Wang W, Rando OJ, Xue Y, Swiderek K, Kuo A, Crabtree GR (November 1998). "Rapid and phosphoinositol-dependent binding of the SWI/SNF-like BAF complex to chromatin after T lymphocyte receptor signaling". Cell. 95 (5): 625–36. doi:10.1016/S0092-8674(00)81633-5. PMID 9845365. Martens JA, Winston F (2003). "Recent advances in understanding chromatin remodeling by Swi/Snf complexes". Curr. Opin. Genet. Dev. 13 (2): 136–42. doi:10.1016/S0959-437X(03)00022-4. PMID 12672490. Wang W, Xue Y, Zhou S, et al. (1996). "Diversity and specialization of mammalian SWI/SNF complexes". Genes Dev. 10 (17): 2117–30. doi:10.1101/gad.10.17.2117. PMID 8804307. Wang W, Côté J, Xue Y, et al. (1996). "Purification and biochemical heterogeneity of the mammalian SWI-SNF complex". EMBO J. 15 (19): 5370–82. PMC 452280 . PMID 8895581. Dallas PB, Cheney IW, Liao DW, et al. (1998). "p300/CREB binding protein-related protein p270 is a component of mammalian SWI/SNF complexes". Mol. Cell. Biol. 18 (6): 3596–603. PMC 108941 . PMID 9584200. Dallas PB, Pacchione S, Wilsker D, et al. (2000). "The human SWI-SNF complex protein p270 is an ARID family member with non-sequence-specific DNA binding activity". Mol. Cell. Biol. 20 (9): 3137–46. doi:10.1128/MCB.20.9.3137-3146.2000. PMC 85608 . PMID 10757798. Nie Z, Xue Y, Yang D, et al. (2000). "A specificity and targeting subunit of a human SWI/SNF family-related chromatin-remodeling complex". Mol. Cell. Biol. 20 (23): 8879–88. doi:10.1128/MCB.20.23.8879-8888.2000. PMC 86543 . PMID 11073988. Takeuchi T, Nicole S, Misaki A, et al. (2001). "Expression of SMARCF1, a truncated form of SWI1, in neuroblastoma". Am. J. Pathol. 158 (2): 663–72. doi:10.1016/S0002-9440(10)64008-4. PMC 1850330 . PMID 11159203. Kozmik Z, Machon O, Králová J, et al. (2001). "Characterization of mammalian orthologues of the Drosophila osa gene: cDNA cloning, expression, chromosomal localization, and direct physical interaction with Brahma chromatin-remodeling complex". Genomics. 73 (2): 140–8. doi:10.1006/geno.2001.6477. PMID 11318604. Kato H, Tjernberg A, Zhang W, et al. (2002). "SYT associates with human SNF/SWI complexes and the C-terminal region of its fusion partner SSX1 targets histones". J. Biol. Chem. 277 (7): 5498–505. doi:10.1074/jbc.M108702200. PMID 11734557. Lemon B, Inouye C, King DS, Tjian R (2002). "Selectivity of chromatin-remodelling cofactors for ligand-activated transcription". Nature. 414 (6866): 924–8. doi:10.1038/414924a. PMID 11780067. Hurlstone AF, Olave IA, Barker N, et al. (2002). "Cloning and characterization of hELD/OSA1, a novel BRG1 interacting protein". Biochem. J. 364 (Pt 1): 255–64. PMC 1222568 . PMID 11988099. Inoue H, Furukawa T, Giannakopoulos S, et al. (2003). "Largest subunits of the human SWI/SNF chromatin-remodeling complex promote transcriptional activation by steroid hormone receptors". J. Biol. Chem. 277 (44): 41674–85. doi:10.1074/jbc.M205961200. PMID 12200431. Nie Z, Yan Z, Chen EH, et al. (2003). "Novel SWI/SNF chromatin-remodeling complexes contain a mixed-lineage leukemia chromosomal translocation partner". Mol. Cell. Biol. 23 (8): 2942–52. doi:10.1128/MCB.23.8.2942-2952.2003. PMC 152562 . PMID 12665591. Kitagawa H, Fujiki R, Yoshimura K, et al. (2003). "The chromatin-remodeling complex WINAC targets a nuclear receptor to promoters and is impaired in Williams syndrome". Cell. 113 (7): 905–17. doi:10.1016/S0092-8674(03)00436-7. PMID 12837248.